642 stories that can help beginning readers learn to read. Supports the Read Well Reading Program. 642 stories that support the Read Well Reading Program. 877 stories that can help beginning readers learn to read sight words. Supports the Edmark 1 Reading Program. 120 stories that support the Language! (Fourth Edition) Reading Program. 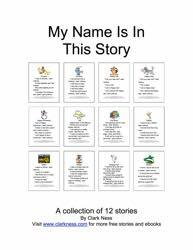 64 personalized stories and 4 personalized ebooks. Beginning readers enjoy seeing their names in print. There are currently over 1,900 first names of beginning readers available from this website. If your beginning reader is not on the list just send an email to have him or her's first name placed in the stories and ebooks for free. OpenDyslexic font is designed to be easier to read for struggling readers with dyslexia.Current research shows no reading improvement with this font, though your beginning reader may be more comfortable reading ebooks written this way. These ebooks support The Daily 5 which is an education program that helps students learn how to use activities to work independently toward personal literacy goals. I am a former special education teacher from Spokane Valley, Washington USA and have created these free stories, ebooks and other materials for use in the classroom and at home. I hope your beginning readers will be helped by what I am able to share with you on this website. I am a member of the Society of Children's Book Writers and Illustrators and the International Literacy Association. Please feel free to let other teachers and parents know about www.clarkness.com and www.readinghawk.com. All stories, ebooks and other material on this website are covered under the following copyright:Text Copyright © by Clark Ness. Images are from Microsoft Office Images unless otherwise noted. PERMISSION IS GRANTED for printing, photocopying, emailing, recording, storing in a retrieval system, and transmitting these stories, ebooks and other materials in any form, or by any means, mechanical and/or electronic. Sale of these stories, ebooks and other materials and/or uploading them to a commercial bookstore or commercial website is strictly forbidden without prior written permission.